Designed with compatibility for MP3, MP2, BWF, WAV formats the PMD670 boasts an impressive 40 assignable quality settings as well as a FAT32 File Allocation Table for future multi-gig file capability. With the flip of a switch record audio files to affordable and widely available Microdrives or compact flash cards. 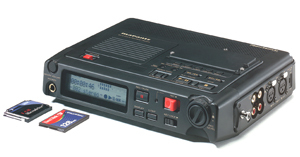 A portable/table-top portable model, the PMD670 features a computer I/O connection that allows it to be easily linked for easy file transfer. Drag and drop recorded audio files to your computers hard drive in minutes without the real-time delay disadvantages of cassette, MiniDisc, and DAT recording.